BROWN MANUFACTURING COMPANY supplies more than 200 different vintage wall mounted bottle openers and a line of about three dozen bottle cap catchers. The openers are stationary, and most are made of cast iron or are zinc plated. The designs include popular licensed logos, such as Coca-Cola, and recognized foreign symbols and logos. They also include embossed designs and printed ones. 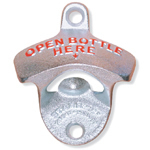 The bottle cap catchers are also for wall mounted use beneath the openers. Some carry logos, but most are plain and include units of plastic, anodized aluminum and stainless steel. The openers and cap catchers are sold separately and also in sets. Retailers can view the entire catalog at the company website. They can also register online and obtain approval to place orders online. There is no minimum order, but volume orders obtain larger discounts. The bottle openers typically wholesale for about $2.25 and have a suggested retail price of $6.95 to $7.95. The least expensive plastic cap catchers wholesale for $2, and the wholesale increases to $6 to $7 for stainless steel units. Suggested retail is at least double the wholesale cost. Sets that include both a bottle opener and cap catcher wholesale for $4.50 to $6.50, depending on the design, and the suggested retail price is double wholesale cost or more.